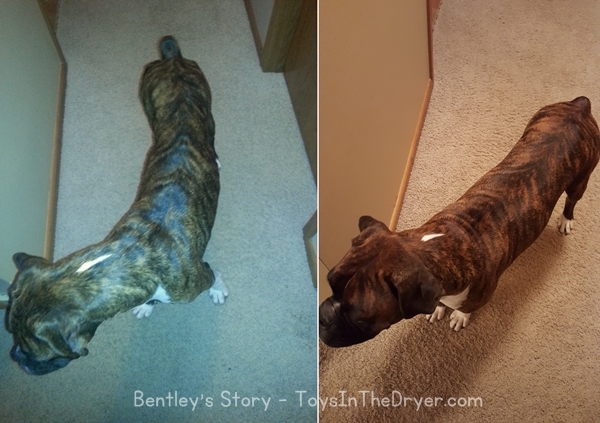 Last week I wrote my first post in a series called Bentley’s Story. 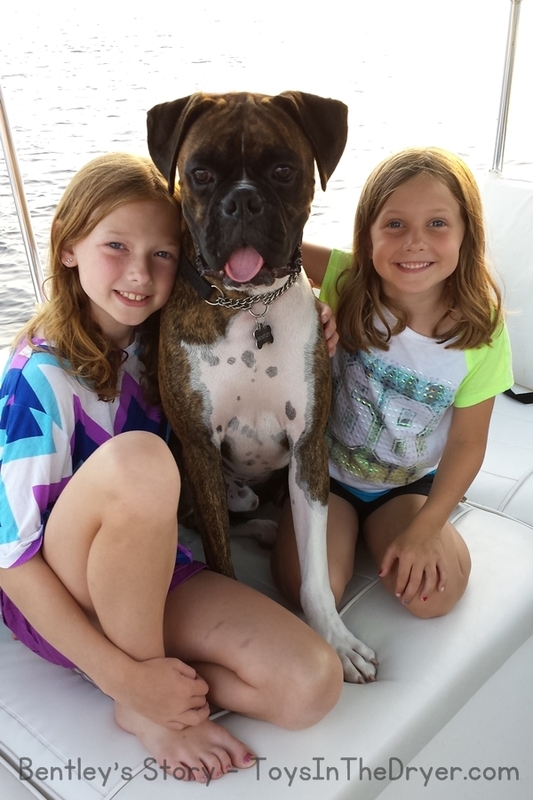 It is the story of how we adopted our boxer Bentley. He has been with our family for almost a year and lately I’ve been feeling compelled to share his and our story. Bentley adored human attention when he first arrived at our house. He still sleeps like this at times! I ended my first post with him joining the transport from North Carolina to Minnesota. Across America Boxer Rescue rescues dogs from all over the US. They have this awesome transport team that drives dogs from the southern states to families in the northern states. I’ll tell you more about it in another post. As I said, Bentley was found as a stray and was pulled from a shelter and placed in a temporary foster home. He was in his temporary foster home for one week before joining the transport to us so his temporary foster family gave me little information on him except that he was about 1.5 years old, super friendly, good with other dogs, and difficult on a leash. They didn’t know how he behaved with kids as they did not have children, and they didn’t really know how he behaved in a house because they kept him in an outdoor kennel. We opted to foster-to-adopt him instead of outright adoption because so little was known about him. Bentley’s adoption photo. I’m holding his signed adoption contract! You can read about Bentley’s first 24 hours with us and my initial thoughts on him in my post Introducing Bentley. It’s so hard to see in the photos but he was skin and bones when we got him. You could see every bone in his body. He was (and still is) such a good boy! He must have been someone’s pet at one point in time because he knew how to sit and somewhat stay. He was fully house trained (only had one accident and he went downstairs on the concrete to have his accident!). He also went straight to his dog bed as soon as we sat down at the dinner table. He did tug horribly on the leash but I used Cesar Milan’s leash training method and after only two walks he quit pulling (except when other dogs walk by, we are STILL working on that!). He’s finally the right weight! Bentley had some stomach issues when he arrived at our house. He had horrible diarrhea and sometimes just wouldn’t eat. He went through a bout of pancreatitis and had trouble gaining weight. Speciality dog foods and medications helped him put on much needed weight and he’s now the perfect size. It’s been almost a year and we are now transitioning him over to regular dog food. A little less than a month after joining our family we knew Bentley was the perfect dog for us. 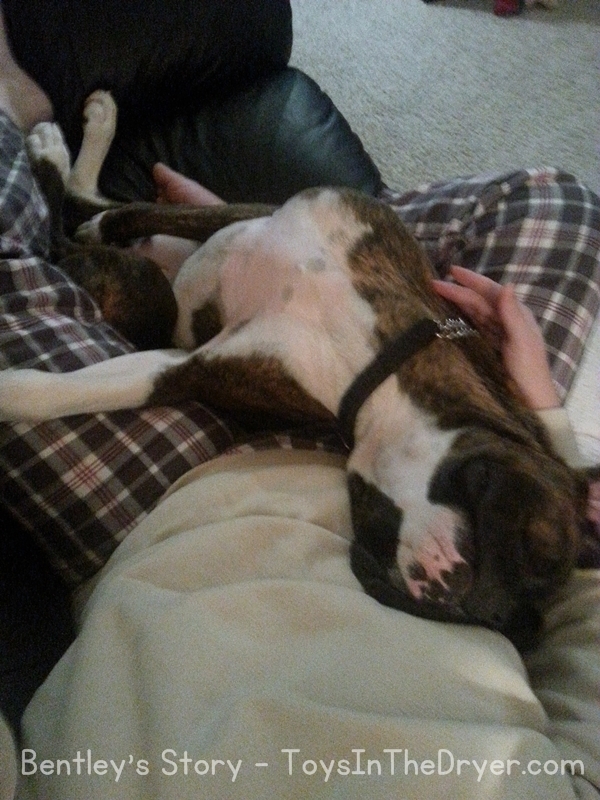 We called Across America Boxer Rescue and made his adoption official. Bentley is by far the smartest boxer we have owned. He’s also the most adaptable. He loves the dog park, learns commands quickly, would be GREAT at agility if I had the time, energy, and money to put into it, loves the water (as long as he’s got his life jacket – he can’t swim! ), and doesn’t mind sleeping on our boat or in a tent. He gets along with everyone he meets and knows how to behave himself around other dogs that are more dominant than him. I often wonder what Bentley’s life was like before he found his furever home with us. Did his previous family love him? Was he abandoned? How long was he on the streets? He’s got some scarring on his face. Where did those scars come from? I’ll never know what happened in his previous life but I do know that for the rest of his life he will be a spoiled rotten dog! Stay tuned for my last post in Bentley’s story, the adoption process itself. I’ll just say it was a long, heartbreaking time! Poor thing – he’s so lucky that he’s with you now. I will never understand how some dogs end up in such situations. He’s obviously a good dog. You have to hope he wasn’t abandoned or abused. But whatever it was he has the life now! Aww he sounds like such a sweet dog! You’re giving him the best life ever. Aww thanks for sharing his story with all of us. It sounds like he’s a perfect fit for your fam. Poor Bentley. I hate hearing how skinny dogs are before adopted – it’s so sad. I am happy to see and hear that he is doing so well. I grew up with dogs all my life until I had kids, so I know how lovable dogs are. Congrats on adopting him!! He’s a beautiful dog. 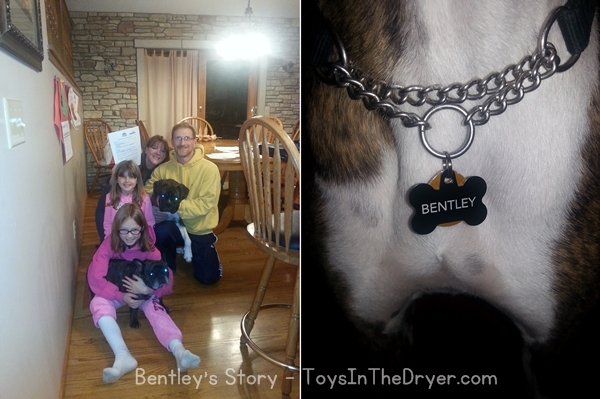 Bentley is certainly a terrific addition to your family. I am so glad his health issues seem to have cleared up.